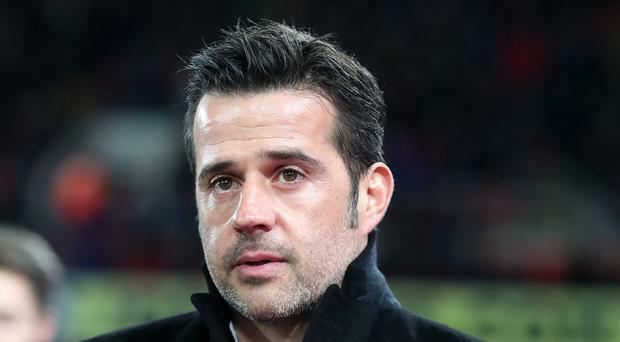 Marco Silva has dismissed suggestions the decline in Watford's form owes to Everton's attempts to recruit him. A promising start to the season contributed to Everton's attempts to appoint him as their new manager, and while Sam Allardyce has since taken that role, Silva's team has lost six of their past nine. The Portuguese had wanted to discuss succeeding the sacked Ronald Koeman at Goodison Park, but while Watford rejected their rivals' advances, concerns persist that that episode remains a distraction. Silva was critical of his team after they lost 2-1 at Crystal Palace on Tuesday having led until the 89th minute, but he insists they have not been rewarded for their performances and that any links with Everton have had no affect. "Do you really think this question makes sense?" he responded when asked if the two were related. "Did you see all of our matches? If you saw, you wouldn't ask this question. "It's easy to understand if you look at the table, 'Okay they lost, they won, they drew', if you look only for the results. "But you need to understand how the team plays, how the team competes. I'm sure you didn't see all of the matches. "If you want to only look for the last match: for me it's the whole season not one match. Our position: we are within our goal. You can win, draw or lose, that's normal. "We take the risks to win every game, that's our philosophy. If somebody paid attention, it's easy to understand." Silva's team on Saturday host Huddersfield, who last scored an away goal on the opening day of the season. The in-form Richarlison has been passed fit to start, but Tom Cleverley's suspension further reduces Watford's midfield options at a time when Will Hughes and Nathaniel Chalobah are also injured. A hamstring injury means Kiko Femenia is a further absentee, despite having been in contention to return, and Silva said of their coming opponents: "They did well until now. They started very well. "Normally when you have been promoted you've won a lot of matches and come with a lot of confidence. They'll come here to take a good result. "Their away form is not the best but I'm sure they come here to create problems and take a good result. "We need to keep focused and pay attention."